It has been three months since I started using ASUS RT-AC68U as my home router. I have set up DUAL WAN, Port forwarding, DDNS , AiDisc and AiCloud features. In this post I am going to walk you through dual WAN router settings. I am not going to cover the basic WAN settings as there are lot of posts which tells you hot to do it and also the Quick Settings wizard helps to easily set the router up and running for you. In this blog post, I am going to cover DUAL WAN which I like the most. before setting up the DUAL WAN , make sure you have the latest firmware. the latest firmware as on Sep 04, 2014 is 3.0.0.4.376_1663. For some reason, the option provided in the Firmware page under "Administration" menu did not detect the latest firmware. you can manually download and install the latest firmware always from the ASUS support page RT-AC68U . It is always better to update the firmware as soon as the new version arrives. ASUS RT-AC68U supports dual wan. i.e you can connect two different ISP connection to the same router. In this case, the dedicated WAN port acts as one WAN port and you can configure any one of the four LAN ports or the USB port (which is used to connect 3G USB Modem) to be second WAN port. You have to set up one of these as Primary WAN and the other one as Secondary WAN. in my set up, I am using dedicated WAN port as Primary WAN and the LAN Port 1 as Secondary WAN. 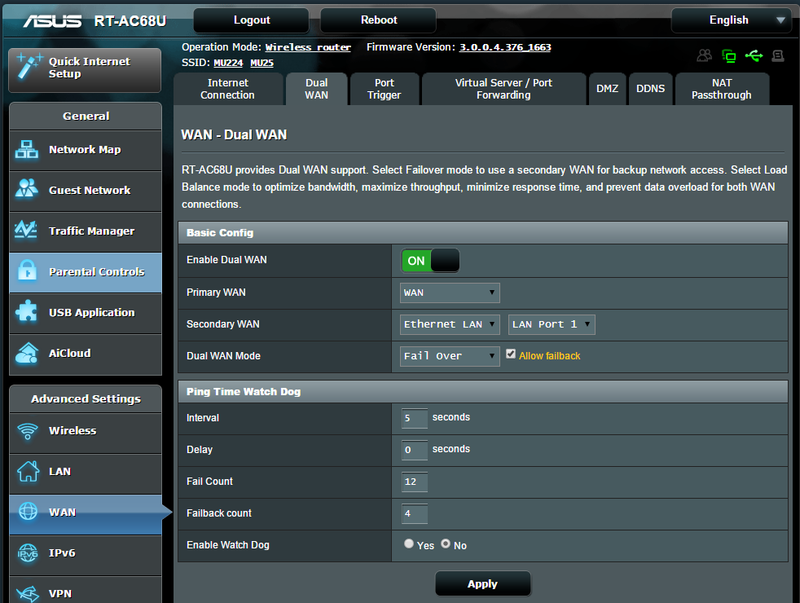 To enable dual WAN option, Go to WAN settings page and choose "Dual Wan" tab at the top. here you can switch the Enable Dual WAN On and you can configure your WAN or one of the 4 LAN ports or the USB as primary wan , you can choose the secondary wan in the same way. Fail over mode - When the Primary WAN internet connection fails, the Secondary WAN kicks in and provides you with the uninterrupted internet connection (actually there is 30 - 60 secs delay before the Secondary WAN kicks in). "Allow Fallback" option allows the router to switch to Primary WAN as soon as it is up. Load Balance mode - when you choose this option, you can distribute the load between two WANs. i.e one request will use the primary WAN and the other request will use the secondary WAN. 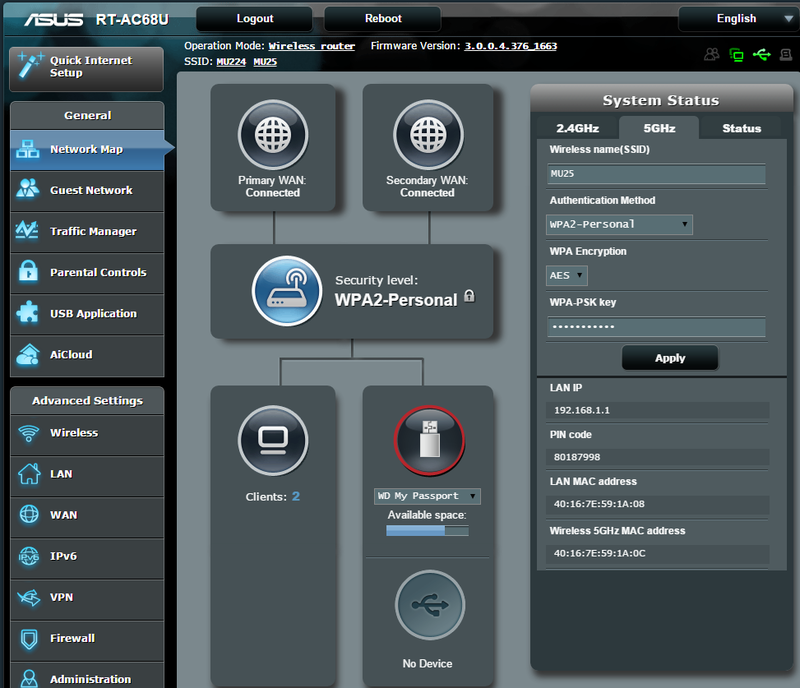 in this mode, you can also configure a particular device to use either Primary or Secondary WAN. for example, you can configure your laptop connected to your local network to use the primary WAN and the smart phone to use the secondary WAN always. when you choose this option, you get additional option to route requests through either primary or secondary WANs. Look at the above settings carefully, by enabling routing rules and adding rules appropriately you can route the entire requests from a particular device through primary wan or secondary wan. In the above setup, my phone(192.168.1.61) uses secondary wan and my laptop (192.168.1.73) uses primary wan. once you have set up the dual wan options, now its time to connect your second WAN cable to LAN Port 1 at the backside of the router and then use the "Internet Connection" tab to configure the primary WAN and secondary WAN connections. In the "Internet Connection" page, use Wan type to choose the Primary WAN or Secondary WAN and enter the username/password details the same way you would set up a single WAN connection. make sure you click "Apply" before setting up the Secondary WAN. please know that when you switch the Primary and Secodary WAN connections in the Dual WAN settings page, it will just switch the WAN ports and not the user name/password associated with these connections and both the connections would fail. In this case, you have to again reconfigure Primary WAN and Secondary WAN settings in the "Internet Connection" tab. once you set up the dual WAN, these changes will be reflected in the "Network Map" . you can see both the Primary WAN and Secondary WAN are connected now. you can check if it is working by manually plugging out the Primary WAN cable and wait for sometime. the primary wan will go as disconnected first. After a while you will see both Primary and Secondary as connected. It looks like this is a bug in this firmware version. when the secondary becomes active it shows both the primary and secondary wan status as connected and you cannot tell which one is really used by the router. you can verify which one is active by clicking on the Primary/Secondary WAN icon in network map and see the difference in assigned WAN IP. when the primary is disconnected and the secondary is active, you can see that assigned ip for both Primary and Secondary are same and this tells that Secondary WAN is used by the router. my primary WAN is ACT broadband which uses Ethernet cable(RJ45) and my secondary WAN is ADSL which uses phone cable (RJ15). I had to convert the ADSL RJ15 to RJ45 to be able to connect to my router as secondary WAN since RT-AC68U does not have an ADSL port. I configured my old adsl modem in bridge mode and connected my modem's LAN output as Secondary WAN to RT-AC68U. I will walk through how to configure the ADSL modem in bridge mode in my next post. stay tuned. Please leave your questions in the comments section and let me know if you have any queries related to this router. I do have some question in relation to this post. My situation is that I have two ISPs. One ADSL is only 0,5 Mbit/s (that is the best I can get where I live) with an internet domain connected. I have a mail and web server at home which works ok with this ADSL. The other one is LTE mobile broadband with high capacity which I use for all other computers at home. Since the RT-AC68U has dual WAN connections I thought that I could connect both ISPs to the router and get one network at home which would simplify my life. My idea is to configure the router for dual WANs in fail over mode with the LTE ISP as primary WAN. I hope this makes all outgoing traffic use the LTE ISP. My big question is if the router will allow incomming traffic on the secondary WAN. How does the secondary work in fail over mode? You can use dual WAN either in Load Balance or in Fail Over mode. if you use Load Balance mode then you can split your internet traffic between Primary and Secondary connections. you can set up your router so that a particular device in your LAN uses either primary or secondary. Or you can let the router make a decision based on the load on primary and secondary. If you use Fail Over mode, the Primary connection is used for all the internet traffic(incoming/outgoing) and the secondary connection will be in stand by mode(idle and not used). When the Primary connection drops, the secondary connection becomes active and this secondary connection is used for all internet traffic until Primary connection becomes live. As soon as primary becomes alive, the secondary goes to stand by mode again. I don't think you can use one connection for outgoing traffic and other one for incoming in any of these modes. For your network , I would suggest you to use LTE ISP as primary. (RT-AC68U has usb port which lets you connect 3G/LTE dongles) and use your ADSL connection as secondary in Fail Over mode. Remember this router's WAN port is RJ45 Jack (similar to LAN port) and you would wanna use an adsl modem in bridge mode before connecting to this router, if your ISP is using telephone lines for internet. Thanks for reading my post. Excuse my delayed replies and typos. I met with an accident and I have to use my left hand for all the typing for one more month. I will reply as soon as I can. Muthuraj Krishnasamy, hows the load balancing is working out between WAN's? I know you can read all you want on reviews, but will never know until you try lol. Andy, I tried Load Balancing as soon as i got the router but the firmware was so buggy at that time. Unfortunately I cannot test dual WAN now as I am using only one Internet connection now. But the current firmware is more stable and I don't see any reason why this router cannot be used for load balanced mode. If you are going for two separate routers then its going to cost you more. In Load Balanced Mode, you can set up rules such that a particular device always use a particular WAN. for example your laptop will always use Internet connection #1 and your phone will always use Internet connection #2. I would say, if you have more gadgets that connect to internet and you need a powerful router than go for this one. this router's price has also come down quite a bit. Hi, thanks for this post. I have the same router but for some reason I cannot type text ie: "ALL" in the routing rules, only numbers (IP addresses). Asus support has been non-existent. Any ideas why that would be? When specifying routing rules, Just leave the source/destination field empty and click "+" and it will add "all" automatically. Hey one more question. I got it set up the way I think it should work. Hey, I wanted test Dual WAN functionality with routing rules before replying to you. It absolutely works fine without any issue at all. I used one of my android phones(SGS II) as secondary WAN. 1. I used my SGSII mobile as secondary WAN. connected it to USB 2.0 port and enabled USB tethering. 6. Here is the interesting part, When I switched the tethering off in my SGSII literally shutting the secondary WAN off, my Nexus 5 which was configured to use Secondary WAN as per routing rules, started using the PRIMARY WAN automatically. Here are few things you can check..
1. make sure your USB modem works by setting it as primary and disconnecting the other WAN. the router reboots and the client devices may get assigned a new LAN ip address. you can also use manual ip assignment for devices configured in load balancing rules. 3. Make sure the router firmware is up to date. the firmware version I am using is "3.0.0.4.378_4585". sometimes lot of issues go away with a new firmware. but it may also bring some of its own lolz..
hope this helps and hope you will be able to get it working as well. let me know if you want me to look at anything else. Hi thanks for this good post. I have two WANs from two different ISPs. My first router is Asus RT-N12 & would like to make it as Primary WAN... I know that I need to set this router up first, as you show here in your post. My question is, did I need to configure my second router? Thanks a lot if you can reply me asap. Yeah I want to setup a dual WAN on my router. My router, ASUS RT-N12HP do support Dual WAN cause it had an option in it setting. So, my question is, do I need to make any configuration on my second router (as SECONDARY WAN) ? Or is it just enough if I make configuration on my Asus router as PRIMARY WAN? You will have to configure both primary and secondary WAN. once you do this, now it is like setting up two separate routers with two separate isp. 2. Connect ur primary wan isp cable to wan port and secondary isp cable to LAN1 Port. 3. Now go to wan settings page, you will see a field wan type at the top to choose if the displayed configuration is for primary wan or secondary wan. Choose primary and set the user name / password and other settings for your primary isp. Now save this. Now choose wan type as secondary and set the username/password and other settings for your secondary isp ans save this. Now if you select between primary and secondary at the top, you can see the displayed configurations change. If you go to network map page, you can see the status of primary and secondary wans. Thanks. I was wondering if it switches back to primary when it starts working again. This has answered it. Yes. It is controlled by "Allow fall back"
Excellent post. I just bought this router and I'm learning about its capabilities before arrives. I was wondering if it's possible to setup the dual wan configuration using the router as a repeater, connecting from two different wifi networks as WANs and enabling "Fail over mode" or "Load Balance mode" to my subnet. Thanks for visiting my blog Carlos. update the firmware as soon as you get the router. I think whatever you are trying to do is possible. Let us know if you are able to do this. Hey Carlos. I did not see your comment properly. You cannot use two wifi networks for dual wan setup. You can either use two LAN ports or one LAN port and an USB port as WAN inputs in dual WAN setup. Hope this helps. Thanks for your blog. I read this a couple of months ago and bought this router for the dual WAN abilities. Have an ACT as primary, and an Airtel as secondary. Somehow each works when I keep them as primary and dual WAN capability switched off. I cannot get the Airtel to work thru the LAN port when it is configured as a secondary WAN port. Any suggestions? Now I have Airtel on the WAN and it works fine with Dual WAN switched off. When I switch dual WAN on, and now the ACT is not working, I can never get the Airtel to get an internet connection thru LAN 1 which I have selected as the dual WAN port. I guess you have enabled failover mode in dual WAN settings. If you enable failover mode then the secondary WAN will work only when the primary is down. change it to load balancing mode and set some rules as specified in the blog and give it a try again. Thanks. Seems to be working now. Don't know what was wrong. I struggled all afternoon. Thanks for the tip on firmware update too. Great post, thanks! I have the DSL ASUS AC68U and I am hoping to set up the dual wan with my DSL provider as a secondary wan but the router gui does not seem to offer me that option. That is the option to choose the dsl only shows up next to the "Primary wan". Next to the "Secondary wan" the only two choices I get are "usb" and "ethernet wan". I have not yet connected my second ethernet to any port but I was wondering whether you know if it is possible to set the dsl port as a secondary wan. I want to use the fail over option with my non-dsl port as primary. Hi Andreas, I am glad that you liked my post. I don't know why your router UI does not have the option to choose LAN/USB as primary. I get WAN/LAN/USB options for both primary and secondary in dual WAN settings. I am not sure if it is the limitation since it is an ADSL Modem + Router combo(I hope it should not be). I will let you know if I find any solution. You can also post here if you find any solution as it will help others. Thanks for the quick response. I am on the latest firmware and I have set up my second wan. I have also tried a different browser but the options remain the same. Primary allows for dsl/usb/ethernet while secondary only allows for usb/ethernet. Until I find out whether the issue is a constraint on the dsl router model do you have any suggestions on my best setup. When I use fail over I have to unplug the dsl to get the second wan to connect (is there another way to use the secondary without removing the dsl physically?). My ethernet connection is about 3 times as fast as my dsl connection so I was hoping that it would be primary. Is it worth using load balance and dedicating certain devices to the fast (secondary router) and others to the slower? Your advice would be appreciated. since your ethernet connection is faster, I would suggest you to add some routing rules as specified in the post so that your main devices will always use the secondary WAN. you need to assign static LAN IPs to your devices. this can easily be done as follows. connect all your devices to the router using wireless/wired connections(I use wired LAN for my desktop pc) . Now you can setup static LAN IPs for your devices from LAN->DHCP Server page using mac address/IP binding or quite easily directly from the network map page . Just click on the clients Icon in Network Map and it will list you the devices connected to the router on the right side. now click on each device and enable Mac and IP binding. Once you enable MAP/IP bindings for all your main devices(for exdesktop, laptop, personal phone, game console etc), the LAN ip addresses assigned by the router to these devices will never change. Note down the IP's assigned to each device. Now go to Dual WAN settings and enable load balanced mode and then enable routing rules. Now make two entries for each ip assigned to your devices(you can find out the devices ip from network map page), one with only source ip specified and leaving destination empty, and one more by leaving source empty and only destination ip specified. please select secondary WAN for each and click add. Now all these devices will always use the secondary WAN. You can specify the load balance configuration as 1:9. This will make sure that 9 out of 10 transmissions will go through secondary WAN when a new device not specified in routing rules is connected . When the secondary WAN is down, the router will automatically ignore the routing rules and start using Primary WAN. Now we have some sort of fail over mode implemented. If you do not want your Primary WAN (DSL) to sit idle until the secondary WAN goes down, you can change one or more devices as you see fit with minimum data usage (for ex a Phone and or tablet or both) to use the primary WAN in routing rules. since you have already specified the routing rules , you can easily switch this between primary and secondary. If it is possible and you don't mind returning the router then return it and get the RT-AC68U (non DSL) model. you can buy a DSL modem without wireless router module for cheap price and configure it to use bridge mode and convert your DSL into ethernet output. This is what I did when i had a DSL WAN. This allows flexibility as even if you get a cable internet in future, you will get a cable modem with it and you can connect the ethernet output from cable modem to this router. in DSL model you are forced to use one DSL input. in case of non DSL model, you can use either two ethernet WAN or one Ethernet & USB combo. This is not necessary if you are always going to use a DSL WAN. Again this is my personal opinion and I leave it to you to decide. This is very helpful advice! From what you say I gather you prefer the second solution. If Asus is willing to make the exchange then that might be a good option for me. In the meantime I will try solution 1 for now and get back to you. np..Let me know if it worked for you..
Actually setting up routing rules would be a permanent solution. I tested the transmission ratio(1:9) before recommending routing rules and I found out that it is not per device but it is based on data session. Each client device connected to the router can have many number of data sessions. so if you have 9 different apps open in your laptop or mobile device then the other device that connects to the router will start using the low speed primary WAN in your set up. Even the 10th app that you open in your laptop will get the low speed primary WAN only. For example a single Torrent client app will open hundreds of sessions if you are downloading from torrentz so you may experience lower speeds. In essence, the speed will be inconsistent based on number of data sessions. But if you set up the routing rules, then all the data sessions from a particular client device will always use either Primary or Secondary WAN based on set up and hence the speeds will always be consistent. Hope this helps. If you are not going to have more number of apps running then your current set up should be fine. This does help! This gives me a much clearer understanding of what the ratio does. As I mentioned I have set up router rules as you suggested and with your latest explanation I will keep these rules as permanent. That is cool. I am glad that it worked. I have on question, and I could not find the answer anywhere ;-(. I have one ISP, that gives me a good connection, but It has some "glitches"of 30-60 seconds. .Since i've been playing some games lately (poker online, so it's not a FPS, but 30-60 seconds can make me VERY nervous..), I have noticed it more and more glitches. It's a very good and fast ISP, but for the games I play, I was planning on adding a second WAN. Since FailOver option is not good, since it takes 30-60 seconds to act, I was wondering what happens, when you use Balanced Mode, and one connection fails .. How long does it take for the traffic be assigned to the live connection, and if it does come back automatically after the connection is resumed .. how does this happen ?? Thanks for reading my post. it takes about 5-10 secs for the traffic to switch from secondary to primary when the secondary fails. It takes about the same time when secondary is up. I can say it takes only 5-10 secs to switch between primary and secondary in load balanced mode and not more than that. Hi - any idea on how does it detect failure in load balance mode ? the "ping to google.com" option is enabled only in failover mode. the issue is, in load balance mode, router is not detecting a connection failure properly. I have one ISP with a 85GB limit after which speed drops, and another with 30 gb. Any way that I can switch from one ISP to another? I have the second ISP set to the LAN port, and failover as well as switch back work fine. Now, I have just been unplugging the primary WAN when I reach the limit, but soon I'm shifting the router to a not easily accessible height, so wondered if this could be done thru the router web interface. 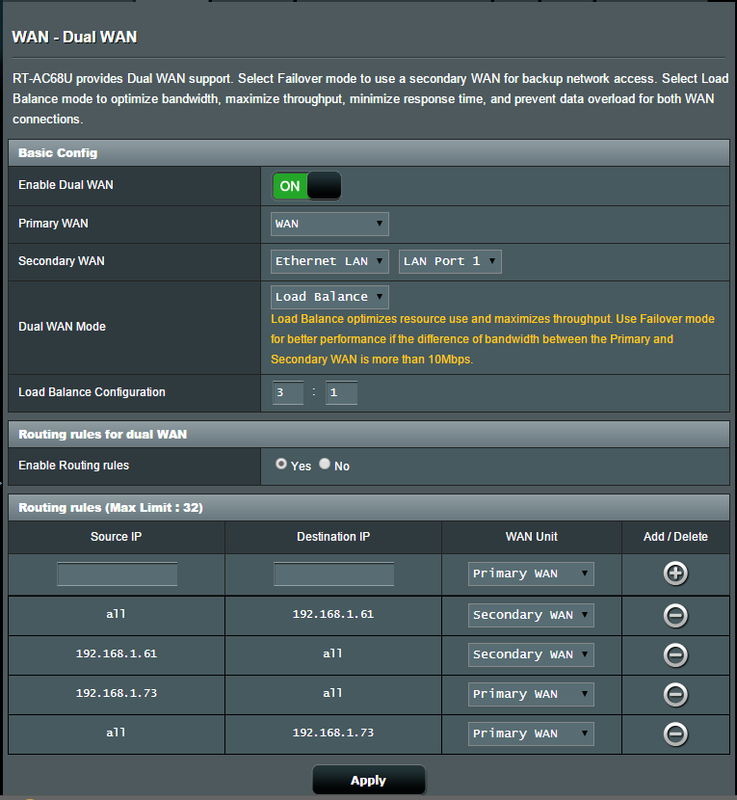 switch the primary and secondary wan type in dual WAN settings. it takes about 2 mins for the router to apply the settings and reboot. now your primary would become secondary and the secondary will become primary. I guess this is a better option compared to unplugging the cables. Is it possible to set primary WAN USB dongle ans secondary WAN also USB dongle from other provider? Yes. It does retain retain the dual WAN settings. When you enable dual WAN It defaults to fail over mode and when you change it to Load Balanced, you can see the rules set up earlier. I am not sure if it retains the WAN settings though(isp username, password etc). I could not test it because I use USB tethering from phone as secondary WAN which does not require any username/password. On an earlier issue: I happened to disconnect my secondary wan and noticed that all my devices with assigned router rules pointing to secondary device were unable to connect to the internet, i.e., they were not reassigned to the primary wan even though the secondary was out. I can of course enter the router and reassign to primary but I just wanted to let you know that it does not seem to work as a fail over. Unless I am missing something. Interesting. what is your firmware version? ..For me it is working absolutely fine. I tested this with my router. I used USB as my secondary WAN but LAN port as secondary WAN should work fine too. As I replied to Rodrigo Meira's comment, it takes about 5 to 10 seconds to detect secondary failure and switch to primary. Hi Andreas, Did you check this again? are the routing rules ignored when your secondary fails or are you still getting no internet connection ? no, the routing rules didnt get ignored and the net connection is down for those devices. i'm using latest firmware as of today. Hi, thanks for all the details explanations, its is possible to setup in dual wan mode to forward the same port to different IP on the network, ..
Hi Leo thanks for visiting my blog. I solved this one myself. Somehow, because I use a password generator, the password I use to log into my router is longer than what the router actually uses. This worked fine when copy pasting at home but not over the web. I now changed the password length to what is acceptable to Asus router and I am fine with AiCloud. I have been toying with AICloud as you can see from my previous query. Something tells me that my connection to my usb disk from the web is through my primary wan. Is there a way I can get access to my home devices through my secondary wan that has a far greater upload speed? Hi is load balancing will make your internet connection fast ? No, It will not literally increase the speed to Primary internet connection speed + Secondary connection speed. If you have two internet connections with almost similar speeds then you can use load balancing to let some devices use primary internet connection and other devices to use the secondary internet connection. this way only few devices share a particular internet connection and it is going to benefit from that. if i choose 1:1 ration for load balancing, will it evenly distribute bandwidth? I have 15mbps LTE + 10mbps HSPA network. I don't think so. The ration you specify for load balancing is for data sessions and not for devices. Each device can have multiple data sessions. For example, if you open facebook app and twitter app in your smartphone then it will have two data sessions. when the ration is specified as 1:1 then the first data session will use primary wan and the second data session will use secondary wan and the next one will again use primary and so on. Hello my friend. I am interest to buy this router and i wanna now, if the to lan fron 2 different isp's can by combine the speed in load balancing mode and not separete only the traffic. Example , i have active only one pc, can this router somehow give me, almost, the speed of this isp's??? Hi VaL, it cannot combine the speed of two different internet connections. It can only distribute the load between them. Sorry for very late reply. It should be possible. you can use the WAN Port as primary and LAN port as secondary. you can configure each using a static IP provided by your isp. wan primary wan (VDSL 100/20) wan secondary lan1 (VDSL 50/10) in load balance so i should see my bandwitdh goes to about 200 megabits when i downloading from multiple source (e.i. download manager) but this doesn't work. there is a lot of useful information here on Dual Wan setup, I am working with my RT-AC68U and I hope someone can help me in setting up my environment. WAN - > Router ADSL provider, with a Public IP but slow download/upload performances. LAN1 -> 4G Router, with NO Public IP but fast download/upload, 4G carrier does a NAT so this means I can't use this interface for any inbound connection from outside (e.g. connect with smartphone to see a webcam for example). one on LAN1 would not be able to listen for incoming connections as per restrictions from 4G provider. So far I played a bit with Dual WAN routing rules, but I have not been able to setup a stable environment. At times OPENVPN SERVER does not seem to listen to connections coming on WAN interface. I'm trying to utilize the dual WAN load balance function on an RT-N66U. The GUI of the setup looks almost identical. I have an apple TV device that I am trying to connect via the vpn client on the router (Note, I am using the vpn client, not the server function). I want all other devices to connect via my normal ISP connection. I am playing around with the Dual WAN to see if I can make that work. I've configured Lan1 as the 2nd WAN connection. I want to try and route 192.198.0.200 (the apple TV) thru the primary WAN using the vpn connection (which I am assuming will be running on the primary WAN), and then all other connections (192.168.0.1-199) thru the Lan1 secondary WAN. Is there a way to set that up on the routing table? Or any other ideas on how to accomplish? If I put a route in for the apple TV, it won't let me use "all" for the other routes. Or am I forced to limit my DHCP pool to 32 entries, and route individually. I have some idea in my mind. I will test it out and update you what I find. Hi I am getting a IP conflict issue when i am trying to connect can you please advise how to sort this issue. Can you please give me more details about the issue you are facing? Hi can i use both isp speed at the same time for my desktop when i am using dual wan? No. It is not possible. You can distribute the load but you cannot combine the speed. I have a dsl line ~5 down and a cable line ~100 down. My cable is my primary and i typically use the dsl in fail over mode. However I have a data cap on my cable line that i want to conserve as much as possible. I was wondering if i could designate routing rules by other than device IP and use external Ip's? For instance; I listen to Amazon music desktop app all day long and would like that to use my secondary dsl line while my desktop mostly uses my primary line. Is this possible ? can i assign an Amazon IP for the source and my (local) desktop Ip for destination ? If it is possible then how would i find that IP address and would it be static u think ? I have a RT-AC68U on the way. So I downloaded the manual from the Asus site but it does not show the Dual WAN menu in the manual. Are there different versions or they just don't list it in the manual? May be. you can find some youtube videos from ASUS about their router UI and also on their support Page. They keep updating the router firmware with bug fixes and new features sometimes. I intent to get a secondary ISP and setup Dual Wan Load Balancing. My Router is in the living room connecting to the Fiber ONT. I connect one of the LAN point to the wall to go through to my bedroom (1 LAN Point). My room LAN is connected to a ASUS 8-port switch. Question here is can I set the devices in my room (connected to the switch) to different WAN per Switch Port? Connect your devices to switch as you normally do. When you access the router Page, you can see the assigned IP address for each of the device connected to the router via switch. once you know the LAN IP addresses of the devices connected to switch, you can set up the routing rules as specified in this article to achieve what you want. Can I setup routing rules for only specific IP, and others devices (HPs) I will just choose to direct to one of the WAN Setup? Verry great Post here ! I have issue with dual wan in load balance mode and remote access to the router. Can i use the routing table to assign the primary wan or secondary wan to get access remotely to the web gui of the router ? Actually i can logon from outside to the router but i loose the connection many time when i move in different menu into the router, it's look that the router receive his external remote cession from one wan and during the cession the wan acces is change and the router ask me to logon again if i force to refresh the start logon adress page. I use one cable modem on Wan1 and a dsl modem on wan 2 with static ip adress and DMZ from the dsl modem to the static ipc router adress. I tried to add routing rule "my remote ip adress" to "ip adress router" with primary wan, but this doesn't fix the issue. Any advise on this ? as the routing rules are normaly for usage of device connected to the router, but what about the router himself and his remote accessibility ? I Re-post my message, as i was not signed. Settings have been updated. Web page will now refresh. Changes have been made to the IP address or port number. You will now be disconnected from RT-AC68U. To access the settings of RT-AC68U, reconnect to the wireless network and use the updated IP address and port number. Hi..What's the version of the firmware running on your device? Pls make sure that you have the latest firmware. I'll also enable dual wan and check this out over this weekend. latest firmware merlin 380.66, (Merlin don't change anny option on the dual wan part of the latest asus stock code). Can you install the stock firmware and see if the problem still exists? I hope your test this weekend will let you find a way to resolve this. Many users complains about the lags of this fonction and the poor reaction from Asus himself. Even Merlin don't touch at all this part of code and for a good raison, if the original code of this function is buggy, why he will do better ? Nevermind, hi purchased a more simple thru dual WAN router TPLINK TL-ER6120 and keep the Asus as a simple WiFi access point.The price of the Asus to just be use in access point is definitely out of competition between other competitors. Really I could not test the dual wan option. I have moved into a new apartment and I have only one wired broadband connection now. I have a usb dongle which i used for dual wan testing but it never works inside my apartment now. I will definitely test it asap and post my findings here. How about other device that I don't set routing rules? Router will select by themselves? "Look at the above settings carefully, by enabling routing rules and adding rules appropriately you can route the entire requests from a particular device through primary wan or secondary wan. In the above setup, my phone(192.168.1.61) uses secondary wan and my laptop (192.168.1.73) uses primary wan." Yes. Router will select either Primary or Secondary based on the load. In my router the load balance was set as (3:2). Also remember that load is not calculated using no of devices connected to the router. i.e it is not per device but it is based on data session. Each client device connected to the router can have many number of data sessions. For example a single Torrent client app will open hundreds of sessions if you are downloading from torrentz. the load is distributed based on datasessions. in (3:2) setup, the first three data sessions will use primary WAN and the next two will use secondary WAN. It support Wildcard Mask ? Fantastic ! this kind of documentation is missing from ASUS side. Finally my network is all set ... thanks ! just wondering if in "Routing rules" "Source IP = all" will ever be required ? Nope Akash. it is not required. only LAN IP as source and "All" as destination is enough. I'm getting up conflict with my dual wan set up in either fail over or load balancing mode. LAN port 1 is connected to a wireless repeater. No DHCP option. IP is leased from the other host AP. I don't understand why it would conflict since they technically should be separate connections and the router should see them as such. I thought about doing that, but I have lots of devices in the house using manual ip so it'd be a hassle to have to fix them all. Guess I'll give it a go. Yes. Please try it and let us know if it fixed the issue. Quick question on the dual WAN failover. Can the routing rules be setup to route all traffic across the primary connection and if there's a failover, only route traffic from specific devices across the secondary? I want to use a 3G/4G dongle as backup and only allow one or two devices to failover. All other traffic should be blocked to prevent using up the 3G/4G data. Using Asus RT-AC87U, is it possible to get dual WAN in fail over mode to work if there is an other router between the router and "internet" (Wan0 below). I mean will it only detect if the connection to internet is lost or does it only detects if the other router is down? I have tried and tried but have not succeeded and would be very grateful if you could help me. The reason for the set up is that the other router (from my ISP) is also connected to the TV-box. I have done some more tests and still it does not work as I like. I'm not sure if I have configured something wrong or misunderstood how it suppose to work or may be there's something wrong with my Asus router. I have talked with Asus support in Sweden, but they seems to have very little knowledge about Dual WAN and could not help. I have also emailed Asus support hoping I reach someone with more technical knowledge. I would like to use the Dual WAN in Fail Over mode with Allow Fallback. I have both tried with and without "Enable Ping to Internet" (www.google.com). Without "Enable Ping to Internet". With "Enable Ping to Internet" (google.com). - Disconnected the wire between the Technicolor router and the Fiber box - FAIL OVER TOGGLED BETWEEN Primary and Secondary WAN in approx 30-60 seconds intervals. INTERNET WAS UNREACHABLE during the time Primary WAN was active. I would be very happy if someone could help me out. Hi - i couldnt get the issue : with "Enable Ping to Internet" (google.com) the system works as you want, right ? Hi, no it does not. With "Enable Ping to Internet" and the wire to the primary disconnected - the system switch between the primary and secondary WAN in 30-60 sec intervals. This mean that the router doesn't have internet connection during half of the time and is more or less unuseful when the primary wan is down. 2) What free networking tool can I use to verify the load balancing is working properly? 2) I used different devices for testing the loadbalance. my laptop, tab and two mobile phones. so when you lookup your wan IP in websites like https://who.is/ from different devices, you should get two different ip addresses(primary/secondary) based on your load balance configuration. Also remember that load balancing is based on data sessions, so different datasessions within a single device will also use either primary or secondary conenction based on the load balance configuration. For ex if you use 2:1 as load balance configuration, first two datasessions will use the primary and the third one will use the secondary. for creating different datasessions,you can launch multiple instances of browser or if you have more than one browser installed in your system, then you can use different browsers. dyndns , download master , ftp server feature can enable on dual wan laod balance mode ? Hi, I hope you are still monitoring this thread since it's kind of old. I am trying to do something similar to your setup. I want all traffic to route to my secondary wan except for one local device to use the primary wan. With your example, I'd have to set up 50 different rules. Is there a way to set up a default WAN 2 and just one rule for the primary WAN? Thanks! The Upcoming All New Dell 3510 Precision Laptop !!! Thanks for visiting. Simple theme. Powered by Blogger.